Hi - My name is Lisa, and I'm a DIY blogger! My husband Joey and I have spent the last 5 years renovating our circa 1971 home. We've pulled up ugly carpet and green vinyl flooring from the Mike & Carol Brady collection. We've painted (and re-painted) every room in our house at least once. We've even added a wall of built-in bookcases. It's been a never-ending parade of power tools since we bought our "forever" home, and we've enjoyed every minute of it. The first room we tackled in our home makeover was the kitchen. When we first viewed the house, the kitchen was in sad shape. Dark cabinets, stained vinyl floors and sculpted shag carpet in the breakfast room (who does that?!) and sad, ugly laminate counter tops. After painting the cabinets, we decided to use porcelain tile for the counter tops. I'll admit, tile can be intimidating, especially for a novice DIYer. But at its most basic level, if you can spread butter and wipe a counter, you can use tile. It really is that easy. 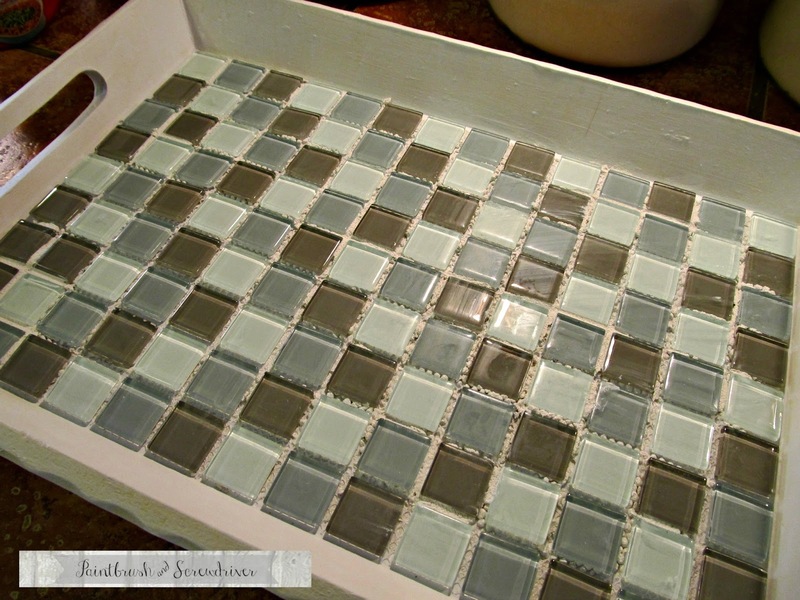 And a great way to get your feet wet is to use glass mosaic tile and dress up a tired old serving tray. Prior to starting my project I lightly sanded my tray and primed it with Kilz primer, to cover a not-so-great attempt at painting the Union Jack. Measure your tray and pick out your tile. 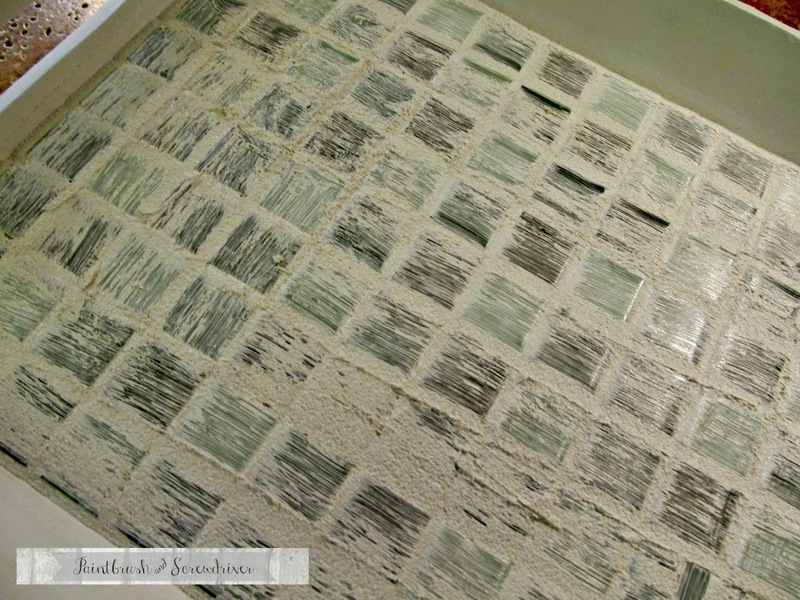 Most mosaic tile comes in 12 x 12 sheets. No matter the size of your project, always do a quick dry-fit. By doing so you'll ensure that you have enough tile, and in larger projects you can plan out your design before you apply adhesive instead of after (don't ask me how I know this). Once you're happy with your design, it's time to get started. 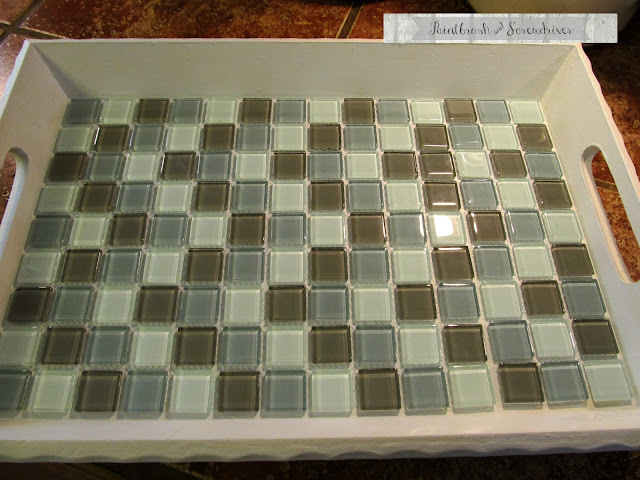 For my tray I used a combination grout/adhesive in bright white and 1 1/4 sheets of mosaic tile. The plastic mesh cuts easily with scissors or kitchen shears. For flooring and counter tops I would definitely use a notched trowel to apply the adhesive, but for such a small area you can get away with a small plastic putty knife. The fact that I couldn't find our notched trowel also influenced my decision. Using your best butter-spreading technique, apply a thin, even layer of adhesive to the tray and carefully lay your tile sheet on top. Press gently to secure the tiles and don't worry if some of the adhesive oozes up through the mesh. Let the adhesive set up for 5-10 minutes, and then get a toothpick and remove any large clumps. Allow the adhesive to cure for several hours, or overnight if you have the patience. 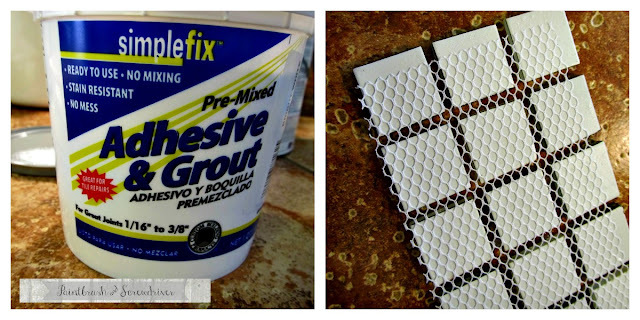 Now it's time to make a mess: let's grout the tiles. Spread an even layer over the tiles, paying special attention to get into the gaps between the tiles. Again, if this were a larger project I would recommend using a float, but I did fine with my putty knife. Using the putty knife, remove as much excess grout from the surface as possible. The rest of the grout will be wiped away with a damp sponge. A word of caution: do NOT rinse your sponge in the sink. Get a bucket and fill it halfway with warm water. Rinse your sponge frequently, wringing well. Change the water a few times if needed. After the excess grout has been removed, let the tray sit for an hour or so. 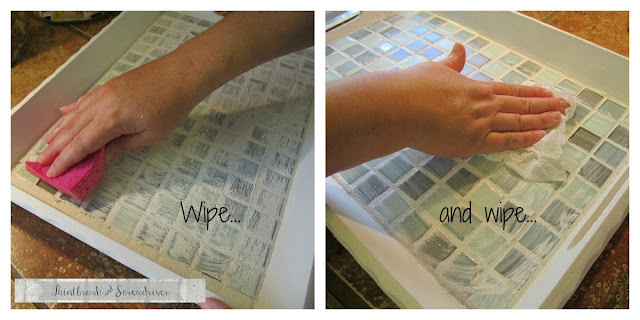 Then wipe down the tile with a damp sponge to remove any haze from the grout. And...voila! 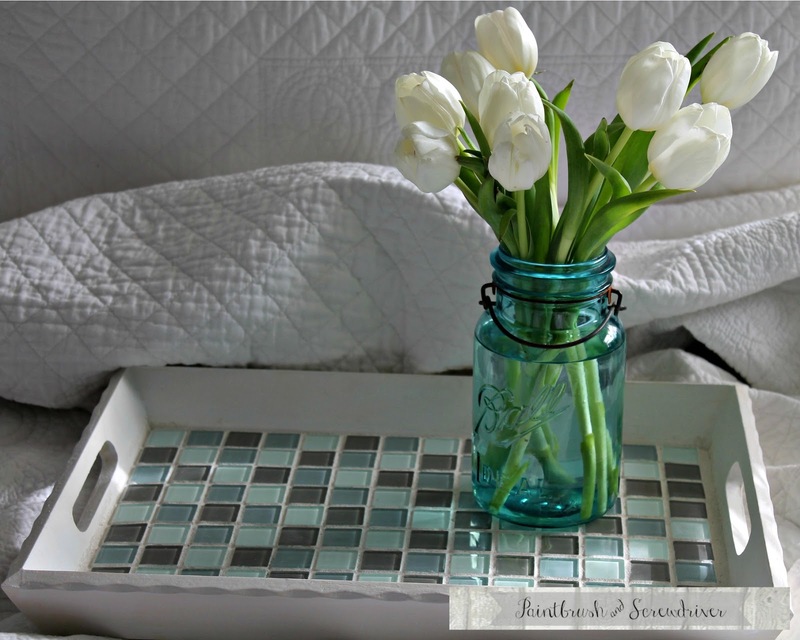 A glass mosaic tray...perfect for breakfast in bed or bringing something delicious to the table. I'd like to thank Carrie for the opportunity to share my tray with you. 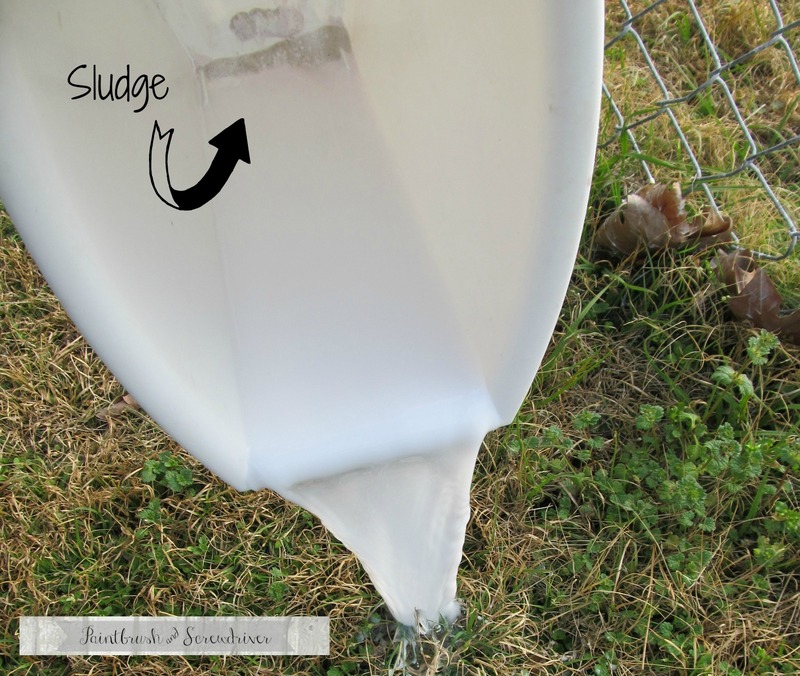 I hope you flex your DIY muscles and give this a try. These make a lovely, practical gift, and it's a project that's easy on the budget. Mosaic tiles generally run between $5-10 per sheet and the adhesive/grout was $9. We invite you to stop by our blog and check out our other projects. We always have a project in mind or in the works, and we'd love to share them with you! what a beautiful project, i just adore this!! Oh my gosh I love this! I want to make one now! Oh my! I love this post so much! This is pretty interesting! I would really love to try this project so soon!